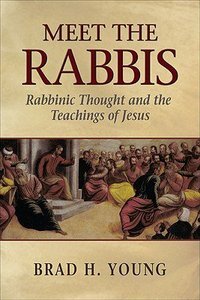 Meet the Rabbis explains to the reader how rabbinic thought was relevant to Jesus and the New Testament world, and hence should be relevant to those people today who read the New Testament. In this sense, rabbinic thought is relevant to every aspect of modern life. Rabbinic literature explores the meaning of living life to its fullest, in right relationship with God and humanity. However, many Christians are not aware of rabbinic thought and literature. Indeed, most individuals in the Western world today, regardless of whether they are Christians, atheists, agnostics, secular community leaders, or some other religious and political persuasions, are more knowledgeable of Jesus' ethical teachings in the Sermon the Mount than the Ethics of the Fathers in a Jewish prayer book. The author seeks to introduce the reader to the world of Torah learning. It is within this world that the authentic cultural background of Jesus' teachings in ancient Judaism is revealed. Young uses parts of the New Testament, especially the Sermon on the Mount, as a springboard for probing rabbinic method. The book is an introduction to rabbinic thought and literature and has three main sections in its layout: Introduction to Rabbinic Thought, Introduction to Rabbinic Literature, and Meet the Rabbis, a biographical description of influential Rabbis from Talmudic sources. Brad H. Young, Ph.D. Hebrew University, studied under David Flusser and is the author of "Jesus and His Jewish Parables" and "The Jewish Background to the Lord's Prayer." He is the president and founder of the Gospel Research Foundation, which is committed to exploring the Jewish roots of the Christian faith, and is on the editorial board of the Compendia Rerum Iudaicarum ad Novum Testamentum.